Getting the family together for Christmas is important to many people, but for those with blended families and grown-up children, it’s especially important to create a space where everybody feels at home – something Amanda Marshall knows first hand. 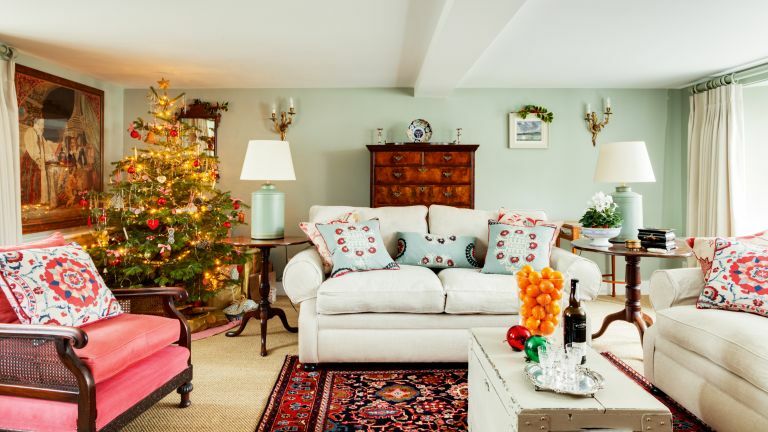 With a family that comprises her two sons, as well as her partner James and his three daughters, the festive season is a busy time. Before she met James, 13 years ago, it was a two-hour school run that prompted Amanda to rethink her location, but the need for a home office drove the choice of property. Although Amanda says the house felt like home as soon as they moved in, it needed a lot of work. She had to replace all the electrics, recarpet throughout and replace both bathrooms immediately. Over the years the house has evolved with the changing needs of her expanding family and business. Her office moved off site, giving them two reception rooms, and removing a wall between the entrance hall and what the family refers to as ‘the yellow room’ – a cosy sitting space – created a welcoming entrance. Of all the work she’s had done over the years, Amanda found the kitchen most stressful. ‘It was a nightmare, and it seemed to take for ever,’ she says. The family relied on camping stoves in the utility room for three months – and a lot of takeaways. When Amanda came to decorate the house, she took an eclectic approach to sourcing furniture and accessories. 'I love the juxtaposition of old and new,' she says. "I love having an idea and making it happen. I wish we had been able to afford to do the bigger jobs first, though, as we’ve had to undo things we’d already done, but you do what you can when you can"
This room was Amanda’s office when she first bought the house, but has since been turned into a formal living space. The large Persian-style rug became the starting point for the eclectic scheme – for similar, try The Rug Seller. Re-caned antique chairs provide seating alongside ‘squidgy’ sofas (try Ikea’s Ektorp design for similar) topped with cushions made by Amanda’s neighbour.